When is a new football kit not a new kit? It’s an exciting time of year for football fans. New kits are unveiled, transfers are made, managers changed and fixture lists revealed. All of which gives club PRs a chance to generate masses of positive media coverage. But when is a new football kit (RRP: £multi-million pound industry) not a new football kit? When it’s designed by Puma. But as the picture above shows, these fans will be feeling a little shortchanged by the PR spin. 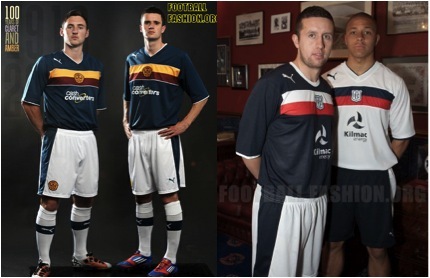 As will Dundee and Motherwell fans (below), but at least Puma seem to have one design for England and one for Scotland. Thanks to Phillip Dyte for sparking this post! ← Jubilee balls or good marketing? In the interests of full disclosure, I should probably reveal that despite my criticisms of the kit, I have still bought a new Coventry home shirt from https://www.ccfcshop.co.uk/index.aspx !